The AAF arrived on Saturday night and proved that we can’t exist for a week without football. Nobody had high expectations of the upstart offseason replacement for the NFL, then we watched a friggin’ game and were blown away. TK things that made the AAF amazing. No. 1 — This sack. For real, you could zoom this in, slow it down and put some dramatic music over it and I would be convinced this was a clip from Any Given Sunday. No. 2 — This touchdown. THIS IS WEEK ONE! Teams aren’t supposed to have fun trick plays dialed in on Week 1. No. 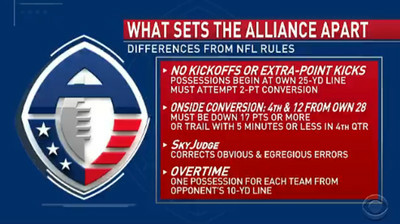 3 — All these changes to NFL rules are genius. I particularly love the onside conversion rule. Right now onside kicks are the least exciting blind hope in football. Less than 1-in-10 ever work, and it often comes down to whether someone makes a mistake, rather than a sign of skill. 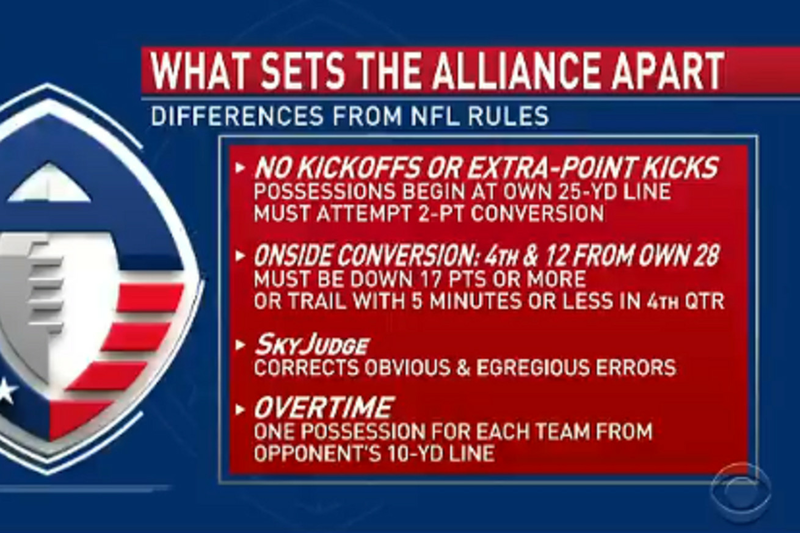 The caveats on the onside conversion keep it fair, but allow teams to maybe turn things around. I love it. A 4th-and-12 conversion on your own 28 is the equivalent of pulling your goalie in hockey. Miss it and you’re going to lose by even more, get it and you have a chance. It’s just what football needs. No. 4 — We get to hear reviews. Instead of the ref being the messenger, or relying on announcers and outside experts to give their opinion, we hear from the only person who matters. It’s brilliant. No. 5 — It’s fun! There might be a time where the AAF becomes competitive enough and the pressure builds to where we won’t have moments like this, but for now we get Steve Spurrier telling his quarterback to rib a wide receiver — and it’s great. No. 6 — People seem really into it. Forget this one poll for a sec. If you spent any time on social media on Saturday night you’d see that almost everyone in the sports sphere was talking about the AAF and loving the game. No. 7 — It’s football after the Super Bowl, and before college starts.